"The school’s principal was mobbed at a Seattle airport when a teenage fan spotted his Forks Spartan jacket and started yelling, “He’s from Forks, he’s from Forks!” The fervour is such, Cook says, that a local evangelist, Hallelujah Bill, has started preaching to fans about the dangers of becoming cult followers of the books." Read the rest of this article, Invaded! 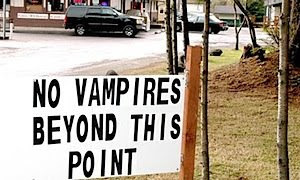 How one small town became overrun with vampires. LOL that is hilarious!! I would laugh so hard if a group of people where walking along, went past that sign and one pale person stayed behind. LOL! Adam right? This is too funny!!! Yes, Grimm, exactly what I was thinking! The funny thing is that I have seen this sign in person. This is the exact sign that is on the border of Forks and La Push. This is what you see when you cross into the reservation. It was awesome, but I didn't get a pic for my collection. That makes me sad, but this pic makes me laugh!